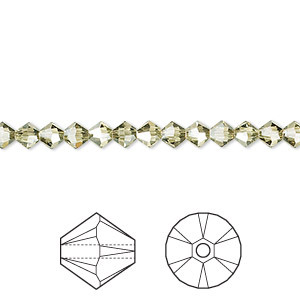 Bead, Swarovski® crystals, jonquil satin, 4mm Xilion bicone (5328). Sold per pkg of 48. Item Number: H20-4445CY Have a question about this item? In color theory, yellow is said to be associated with good cheer and playfulness. The cool yellow of jonquil captures this lighthearted essence in a faded hue that works exceptionally well for floral or springtime-inspired jewelry designs. Bead, Swarovski® crystals, jonquil satin, 4mm Xilion bicone (5328). Sold per pkg of 144 (1 gross). Bead, Swarovski® crystals, jonquil satin, 4mm Xilion bicone (5328). Sold per pkg of 1,440 (10 gross).